Neem is Indian Lilac, which is an important ingredient in Ayurveda, because of its immense number of benefits. It is an herb and you get it throughout the year. It has antibacterial, antifungal, anti-parasitic and anti-inflammatory properties and is great for improving your health and enhancing your beauty. Neem has moisturizing properties, which helps in getting rid of dryness of the skin without making your skin oily. To treat dry skin, mix neem powder with some water and add a few drops of grape seed oil to it. Apply this on your face regularly and you will get a well moisturized skin. By applying the oil of on your skin and mixing neem powder to your face packs, you can reduce aging of the skin. This is because neem is rich in immune-stimulating compounds and has regenerative properties that keep your skin supple. Mix neem powder with lemon juice and add some yogurt to it. Mix them well to get a smooth paste. Apply this on your face regularly and it will help in controlling the excess oil. It is also good for preventing acne and infections which are very common when you have oily skin. Take neem powder and mix it with rose petal powder, little milk and yogurt. Make a smooth paste out of them and apply it on your face. Wait for about 15 minutes and then you can wash with water to which 2 or 3 drops of rose water is added. This will provide you a glowing skin with a clear complexion. Make a paste of neem leaves and turmeric and apply this on your face twice a week. With regular use you will have a blemish free and clear skin. If your skin is very sensitive and you have blackheads, then take 2 or 3 drops of neem oil and dilute it with water. Apply this on the blackheads. With regular use, you can remove blackheads and also prevent the appearance of any more blackheads on your skin. Take 10 neem leaves and add it to some water. Also add a few orange peels to the water. Boil this water till they become soft and cooked. Now blend them well to get a pulp. Apply this pulp on your face and wait till it dries. Now wash your face with cold water. This face pack is good for removing acne and preventing any breakouts. You can also get rid of blackheads and whiteheads by applying this face pack. Add a little honey or yogurt to this pack if your skin is dry. Take 20 leaves of neem and boil it with half a liter of water, till the leaves become soft and discolored. The water then turns green in color. You can strain it and store in a bottle. Use this as a skin toner. Dip a cotton ball in it and wipe your face every night and you will that with regular use, you can get rid of scars, acne, blackheads and pigmentation. Prepare a concoction of neem leaves as mentioned above and mix 100 ml of it with your bathing water. This is a good home remedy for skin infections. Neem is also good for treating skin allergies, infections, psoriasis and eczema. Neem can make your hair strong and also restore the hair that has fallen off. 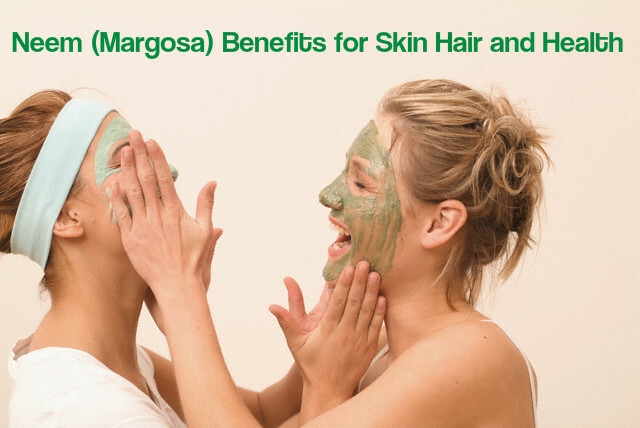 Use neem hair mask regularly and neem water as a rinse. This help in proper growth of your hair. If you have a dry and fizzy hair, neem can help condition your hair. Add water to neem leaves and make a paste of it. Add some honey also. Apply this on your hair and wash off after a few minutes. With regular use you will get hair that is non-fizzy and easy to manage. Take a handful of neem leaves and boil it with 2 cups of water till the color of the leaves changes and the water turns green. After shampooing your hair, use this water as the last rinse. This helps in removing dandruff and keeps your scalp healthy, thus promoting hair growth. Neem is also good for treating itchy scalp. Take about 3 drops of neem oil at the centre of the tongue and swallow it. You can gradually increase it to 4 drops in the second week, 5 drops in the 3rd week and so on, till you make it one teaspoon in six months. You can completely cure asthma this way. It is also good for treating cough, wheezing, and to control breathing. So, by taking neem regularly, you can cure various respiratory disorders. Diseases like chicken pox and small can be treated with neem paste. Place neem leaves around the body of the patient and make him sleep on the neem leaves. This helps in soothing the skin. Neem is also a good cure for patients suffering from herpes and hepatitis b viruses. Neem is also an antipyretic agent. Malaria affects the liver of humans. By eating few leaves of neem daily, you can protect your liver from the side effects of malaria. Neem is a good remedy for any oral problems. It prevents diseases of gums. It is great for preventing bleeding of gums and to get rid of foul smell. Neem has the ability to check the formation of germs in mouth, thus making your breath fresh for a long time. Nem is excellent for removing toxins from the blood and purifying your blood. This protects you from acne, irritations on the skin and so on. It is also good for controlling the production of free radicals in the body. What are the Best Foods to Eat for a Healthy Liver?